I wanted to give you an update on Rita, who has been renamed Annie. 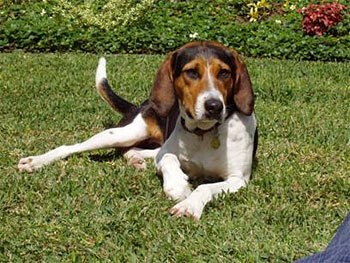 Annie was one of the four Treeing Walker Coonhounds that were rescued from West Virginia and brought to B&B. We are so happy to have her as an addition to our family. She has adapted really well to her new home and has blossomed into a real sweetie. She is a very happy girl and wags her tail so hard she hits herself in the head! Annie was a little shy at first but now is trusting and loveable – she even learned how to play with toys! She takes me for a long walk each morning – I don't even need an alarm clock in the house anymore. Annie has been a perfect fit for us – we're so glad she picked us. Thanks for being there for all of us!